Lifting weights: To call it lifting weights is to already be distracted. Your mind is already divided and lost. Ask just about any elite athlete and they will likely tell you that their best performances emerge in a state of consciousness that is free from discursive activity. You know, it's that "self-talk" or "inner dialogue" that is often narrating the story of your life. When athletes are executing and performing at their very best this symbolic functioning of the mind and its automated inner commentary are suspended. 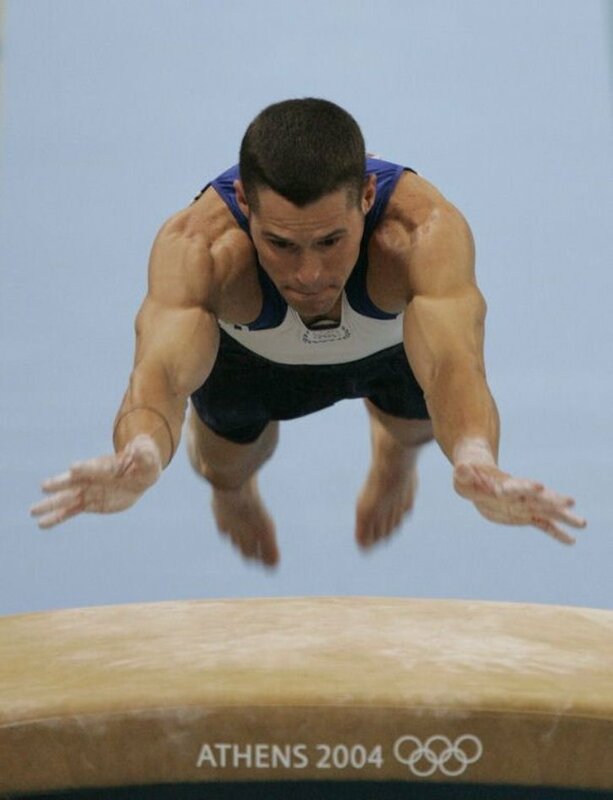 What is happening inside their mind is a simplicity that reaches beyond yet includes immense complexity from years of training and often decades of studying their sport. All in a fraction of a second, clean precise execution unfolds almost effortlessly. Last night I was lecturing to my graduate students on Italian psychiatrist Roberto Assagioli and his system for personal development called Psychosynthesis. His system rests upon leveraging the power of creative imagination to cultivate, refine and establish a more integrated self. Instead of the self being taken over and controlled by "subpersonalities" this more integrated self can control, regulate and mediate how the various subpersonalities find expression, or not. After class last night I found myself swimming laps and doing some agility work in the pool when I was visited by a story I had watched years ago on NFL.com. 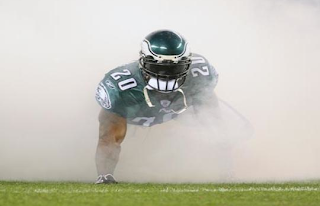 The story was on NFL safety Brian Dawkins and how he prepared for his games. Ok, let's level with each other for a moment. Observable measurable statistics are absolutely essential. 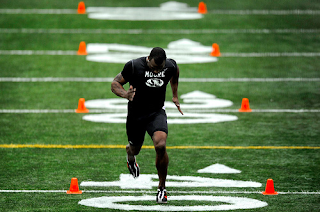 If a football athlete is aiming to join an NFL roster, his 40 yard dash time, vertical jump height and broad jump distance are essential metrics. If he cannot demonstrate an adequate physiological benchmark, he simply cannot play at the next level. It is as simple as that. Or, as we are about to see in the coming weeks with the NFL draft, shaving off or adding on 3 tenths of a second on a linebacker's 40 time can be the difference of gaining or losing tens of millions of dollars. These measures are what I like to call the tangibles, because they are more easily measured, grasped and observed. I remember going into the green turf room just down the hallway from my locker room before my lacrosse games in college at Susquehanna University. 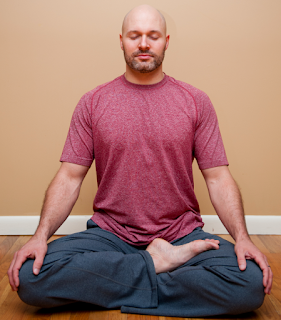 I would disappear from the locker room for 5 or 10 minutes to find my posture of stillness. These brief sessions are amongst the most important meditation practices I did throughout my time in college. They were always, without question, the most enlivening meditations. 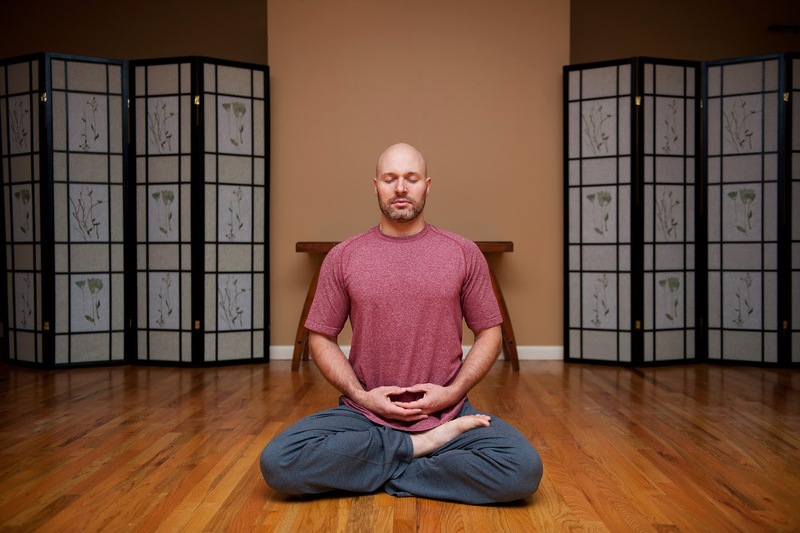 Meditating before a highly competitive game that you pour hours of practice into every day is a different beast altogether than the meditations I would do outside of athletics. 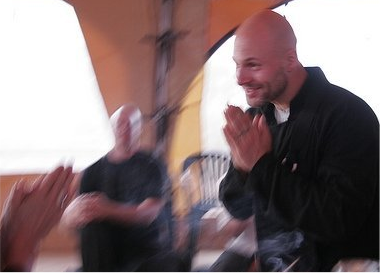 Even today, as I write about this experience, I can feel the subtle threads of anxiety coursing throughout my body, my mind trying to figure out a way to cope with the stress of competition and leadership and the vibrations of aliveness that would build throughout my meditation. Pause a moment and take note of your experience right now. Isn't amazing what 24 words can do to us? 6 in the title of this blog and 18 in my first sentence. Chances are you just experienced what I call "The Lie of Novelty." New York Times writer Gretchen Reynolds writes, "It's widely accepted among scientists that regular exercise transforms the brain, improving the ability to remember and think." Reynolds goes further pointing to a promising body of research supporting the idea that exercise stimulates the creation of new brain cells, a process called neurogenesis. The National Academy of Sciences published a new study showing how testosterone increases in the brain after training could be fueling neurogenesis and brain plasticity. 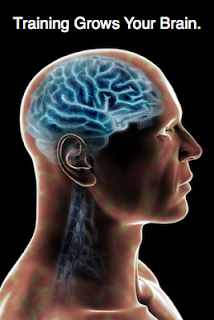 It turns out your brain likely produces a significant amount of the hormone dihydrotestosterone or DHT (as you might have guessed by the name, a derivative of testosterone). Researchers found that the hippocampus - critical for memory formation and spacial navigation - in particular was bathed in this hormone after training and that new neuron growth likely resulted from DHT's uptake in the brain. Reynolds summarizes this stating, "In essence, exercise prompts the production of more DHT. And more DHT helps to create more new brain cells." Can Strength Training improve your emotional intelligence? Strength training may be strengthening your body-mind's capacity for interoception just as much as, perhaps more than, it is strengthening your muscles, connective tissue, and your neurological capacity to innervate muscle fibers through your motor units. So while strength training is often focused upon conventional measures of strength, power and endurance I propose that strength training may also be effective at strengthening your ability to identify, assess and control emotions. Spirituality has two basic drives. It's first drive is for you to be not as defined by the the circumstances of your life. We can call this freedom. You need to be less governed by the events, people and contexts that you find yourself in. When you don't have freedom, the quality of your life suffers and you remain entrenched in the limitations of your life as it presently is. The second drive of spirituality is for you to be more present, connected and engaged with your life. We can call this fullness. While you need to be less governed by the circumstances of your life (freedom) you also need to be more present to what is going on in your life. The quality of your life erodes when you become less connected and engaged with what is happening. Attuning to your relationships, vocation as well as your self that is in the world improves your life and the quality of the lives of those around you. Fitness used to be optional. Generically speaking we can say that "back in the day" evolutionarily speaking movement and survival were intrinsically connected. You had to move to hunt and gather, often times throughout much of the day light. Today we live in a different world where many of us are what we can call "knowledge" workers. If you are a knowledge worker you gain the means to support yourself by creating, following and managing information flow. If this is you then you can spend large portions of your life without moving much. You can spend the vast majority of your days inside a small circumference facing some piece or pieces of technology and or people. In the meantime, movement spikes while walking to the bath room, someone else's movement circumference (office) or to get into your car to then sit still while technology loco-motes you. A few weeks ago I was visiting my parents discussing how my book is landing with their congregation and friends. My mom said to me, "one question I've gotten a few times is, What is habituation?" Considering I mention "habituation" or "habituated" over 160 times throughout a 263 page book, this question is a big deal. Here's how I define it: "habituation is at its essence an automatic response." I continue on to say, "It's opposite is the conscious presence and agency for intentional action. Habituation has two sides. On the one hand some of your automatic conditioned responsiveness is absolutely necessary for your fluid functioning in life. On the other hand some of the automated responses deteriorate your conscious presence and erode your capacity to intentionally direct your life." Habits are a challenging obstacle for everyone. Whether you are trying to get to the gym more consistently, attempting to change how you show up in an intimate relationship, growing out of some old patterns that are holding you back at work or simply trying to attune to your child that's challenging your preferences, habits hold you back. My book Strength To Awaken is an in depth exploration of how to work with habituation for precisely this reason. If you want to change in any area of life, you must confront the habits that hold you. 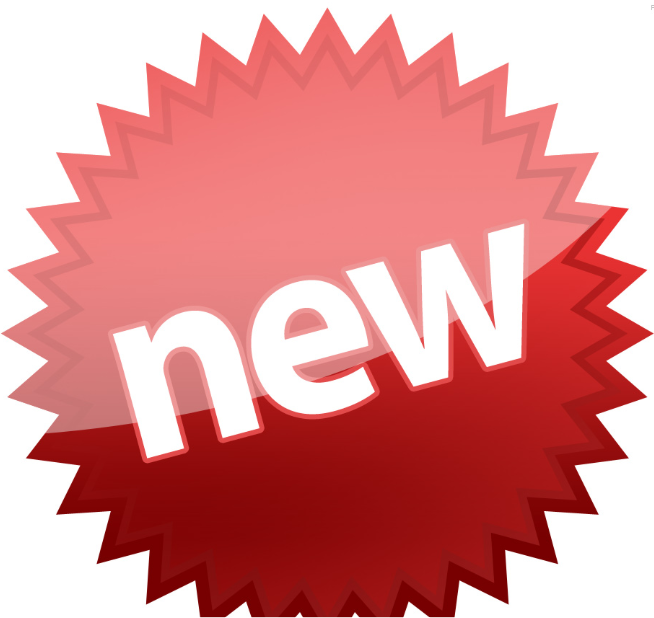 In many challenges learning new strategies, applying new techniques to some area of your life or training yourself to behave differently largely fail. To put this into the words of Robert Kegan, Harvard's professor of Adult Learning and Professional Development, you don't need "technical change" but instead you require "adaptive change." 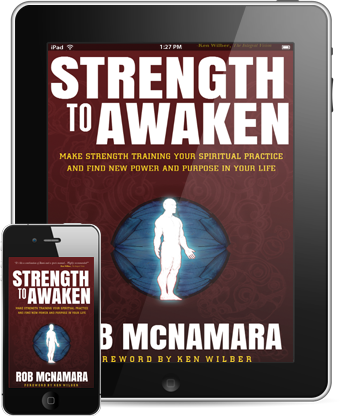 Strength To Awaken is an adaptive approach to working with limiting habits. When we think of fitness revolutions our minds habitually go toward some "fad" or some "new" trend that does indeed change the landscape of "fitness" for a short while. This isn't what I am talking about. Most fads and "new" trends in fitness adhere to the same socially conditioned aims. As long as a fitness movement does not have a genuinely novel orientation, one that is liberated from the social habituations that we are all scripted in, there is no revolution in sight. Fitness as I am re-framing and re-claiming the term here is not interested in shaping your body in some socially habituated aim. Performance or Preference, Which Do You Serve? Performance, genuine elegant performance, requires that you step beyond your habituated preferences. Performing within the sphere of your conditioned preferences is never an expression of your highest levels of elegance and achievement, but instead rote repetition. While repetition is necessary for performance, it is not sufficient. Habituation serves adequacy. Preferences are most often in slavery to comfort. Performance moves with elegance. There is a mysterious effectiveness and grace that is simple, direct, fluid and refined. Look into your peak gestures of performance, I think you know what I am talking about. Put simply performance celebrates what is beautiful - not our cultures conventions around beauty - I'm talking about the heart and essence of beauty. I'm talking about your complete rapture in and as the simple movement of joy. Size, it's a major focus point in the field of strength training. Unfortunately size is not properly understood so I am going to chime in on a few things. 1. You need more muscle mass. If you haven't followed my blog on why - you need to read it here. Muscle mass generally makes you smaller until you have gotten your body fat down to fairly low levels. So for most people, training to gain more muscle mass means you'll trade very dense muscle tissue for very dispersed adipose tissue (this is especially the case when you refine your nutrition to support muscle growth and fat loss). Get bigger muscles & you get smaller. This is the kind of size that's good for most people. If you happen to be a aspiring athlete who wants to get bigger and stronger... slow down! In my book Strength to Awaken I outline a system and philosophy of practice that steps beyond much of the current formulations around integral practice. The old school model, whether you're talking about Ken Wilber's ILP (integral life practice) or Michael Murphy's ITP (integral transformative practice), they are both rooted in a sequential engagement of all of your major faculties. Both approaches totally rock and they have been robust approaches that are genuine strides forwards in the technology of evolving human complexity. And one of their central limitations is that neither explicitly in a rigorous way engage the integral nature of who you are in the immediacy of this moment. How do you train this? That's what my book is all about. Sequence is an inherent part of life, and the natural unfolding of your schedule takes care of the sequential nature of practice. Pick up an integral framework and take it to heart and you will find an integral practice much like Wilber and Murphy propose organically forming in your schedule. Whatever you genuinely value, you will see it showing up in your schedule. However, If you're like most people then you are likely in need of an upgrade from a sequential approach to integral practice to the robust discipline of the full unmediated participation with this immediacy.